I discussed how people come together in groups and need to be able to collaborate in two ways: one by taking instruction and two by giving or receiving advice. The main idea there was that people initially learn from others who have already done something before or who have read it. Then they too later pass that knowledge on to other people that they come in contact with in the same circumstances to help ensure the success of that future group. It’s a kind of a just-in-time knowledge transmission. When the knowledge doesn’t already exist or isn’t known, players build models or theories based on what they observe happening and then test those theories out. If necessary the theory is adjusted until they come up with something that works. Those players or others like them may then come together again but outside the world in wikis, forums, and blogs to build up a community of knowledge, taking it from the tacit to the documented known. I also talked about leadership skills and performance metrics and how WoW provides mechanisms in the game that allow people to examine their own performance and the performance of others around them outside the game. That’s used to learn and to improve individual performance or group performance. Reflection and review, as well as leadership, are valuable skills in the real world, because we need people able to organize people and to look at problems creatively. World of Warcraft fosters and rewards people who are willing to do that. 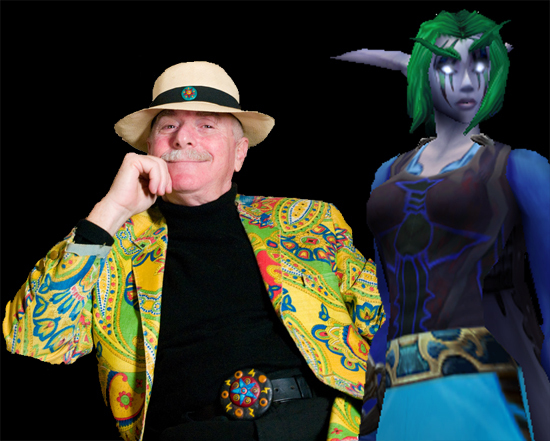 Finally, I discussed the variety of people present in World of Warcraft. In Europe the groups vary not just by age, but by culture as well. Being able to organize and maintain social groups is a skill. Most guilds don’t last a year, but some of the guilds I’ve been associated with have been around since World of Warcraft started and that’s a testament to the skills their leaders have in maintaining community. While communities can coalesce on their own. They don’t maintain themselves. I can’t remember precisely what I said and I have possibly been more literate in places in this post, but the above is some of the gist of what I discussed in the interview. I didn’t record the session. Luckily, Howard’s going to send me a transcript. I’m really excited about the things I’m discovering in World of Warcraft. It was a pleasure to talk to Howard about it. The screen composite of Howard and Elsheindra is licensed by Michelle A. Hoyle under a Creative Commons Attribution-NonCommercial-ShareAlike 3.0 Unported License. Joi Ito published the original image of Howard Rheingold under a Creative Commons Attribution 2.0 Generic license.